Our Optometrists use cutting-edge digital imaging technology to assess your eyes. Many eye diseases, if detected at an early stage, can be treated successfully without total loss of vision. Your retinal Images are stored electronically. 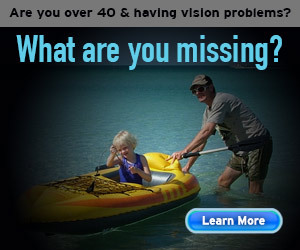 This gives the eye doctor a permanent record of the condition and state of your retina. 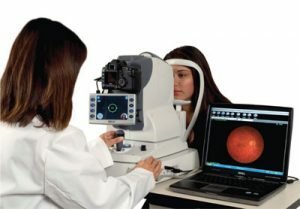 What is a Fundus Camera Camera? A fundus, or retinal camera, A fundus, or retinal camera, is a specialized microscope with an attached camera designed to photograph the central retina, optic disc and macula. Fundus photography documents the retina, The retina is the neurosensory tissue in our eyes which translates the optical images we see into the electrical impulses our brain understands. The Corneal Topographer gives accurate mapping of the corneal curvature. The results are used to assist in contact lens fitting, refractive surgery, orthokeratology and general assessment of the cornea. 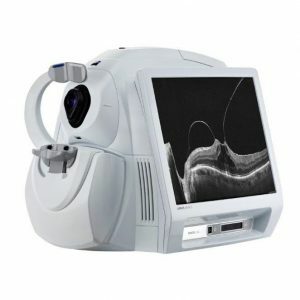 The Corneal Topographer provides superior accuracy of the corneal curvature. The results of this exam will lead to a more comfortable selection of contact lenses that are right for your lifestyle. In addition to being a major part of a contact lens exam, a corneal topographer is used to assist in refractive surgery, orthokeratology and general assessment of the cornea. We have just added the latest in retinal imaging technology, the Zeiss Cirrus 600 which combines digital retinal imaging with Optical Coherence Tomography (sort of like an MRI for the eye). With this we can manage macular degeneration, diabetes, glaucoma and many other eye conditions. We think its cool but eye doctors get excited about odd things.